Do any of you work-out at the gym? I find it easier to workout at the gym rather than at home. It keeps me motivated when I see others getting fit and trying to stay in shape. I also like to take classes at the gym. My weekly exercise workout looks like this: On Monday, Wednesday and Friday at 5:45am, I take a boot camp class at the gym, it's hard! Very hard! On Tuesday and Thursday I workout with my trainer, which is a thirty-minute session, and do twenty minutes on the treadmill. I rest from workouts on the weekends. No matter how much you exercise, your diet is much more important. 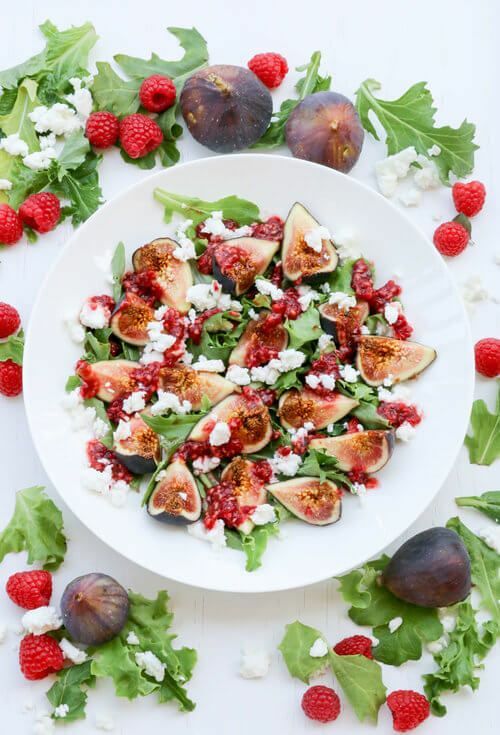 So how about this simple raspberry fig and feta salad! A medium size fig is just 37 calories, they are packed with fiber, and potassium. The mixed greens in this salad promotes bone health and revive muscles. As for the bright pink raspberries, they are perfect for burning fat and increasing blood cells. Place mixed greens on a serving plate. Add sliced figs and crumbled feta cheese. Lightly mash 1/3 cup fresh raspberries and mix with 1 Tablespoon balsamic vinegar. Drizzle on top of the salad.